The U.S. military's health agency approved paying for the surgery after a doctor deemed it "medically necessary." The Defense Department is paying the surgery costs for a transgender service member. A Pentagon spokeswoman confirmed that a person on active duty received gender-affirming surgery Tuesday at a private hospital. The department's Defense Health Agency granted a waiver that let the Pentagon pay for the surgery because a doctor said it was "medically necessary" and the individual had already started a transition-related course of treatment. Two LGBTQ-rights organizations representing transgender service members challenged Trump's directive in court. The lawsuit argues Trump's proposed ban is unconstitutional because it denies transgender members of the military both due process and equal protection. 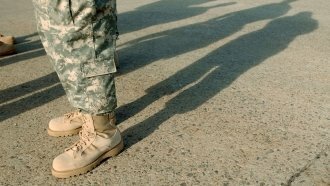 In late October, a federal judge temporarily blocked provisions of the guidance concerning the enlistment and retention of transgender military service members. But the judge denied the lawsuit's challenge to the surgery directive. It's unknown exactly how many service members are transgender. But estimates say at the most, transgender people account for less than 2 percent of the U.S. military, including reserve forces.